From its original roots as a means of winter hunting, skiing has evolved into various societal facets and developed a culture of its own. From racing to resorts, a ski option for every outdoor winter lover is available—at least in the western hemisphere. Traveling east of central Europe, the world of skiing becomes less and less developed. Only in recent years has the potential of areas such as Japan and India begun to surface in the mainstream ski world. India is one of five countries that the mighty Himalayas spreads between. The others include China, Tibet, Pakistan and Nepal. Surprisingly, these mountains, which claim home to some of the world’s best mountaineering, have rarely, if at all, hosted successful ski descents. India is the only Himalayan country out of five that has any existing ski infrastructure or industry. With modern technology and everything researchable through the Internet, people may conclude that without prior beta an activity must not be possible. Such assumptions are not the case with Nepal. 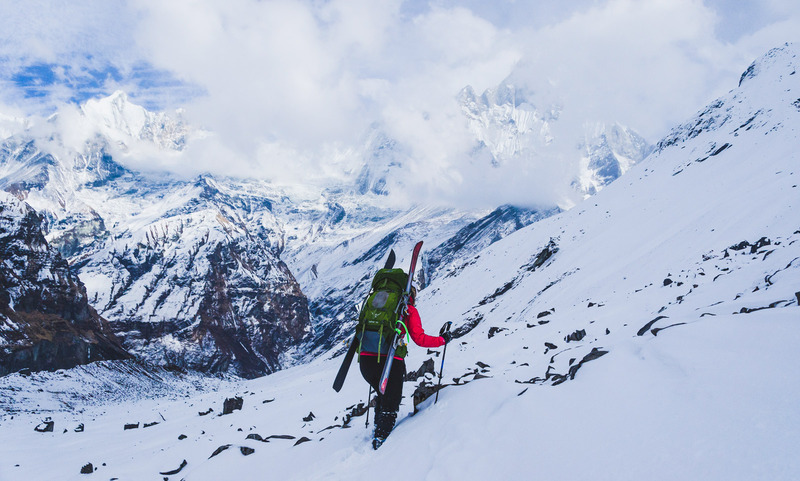 Skiing in Nepal is like traveling back in time to the origins of the ski mountaineering sport. In pursuit of untouched lines, my partner Jason Juhala and I embarked on a journey to embody the backcountry culture by exploring further into the unknown. Our destination was set to the popular trekking route of Annapurna Base Camp. A newly formed organization aimed at bringing a ski and snowboarding school to Nepal helped provide us with some used gear for the expedition. The Ski and Snowboard Foundation Nepal (NFSS) is barely a year old and has the ultimate mission of educating local Nepali how to ski and snowboard by bringing a school to the Himalayas. 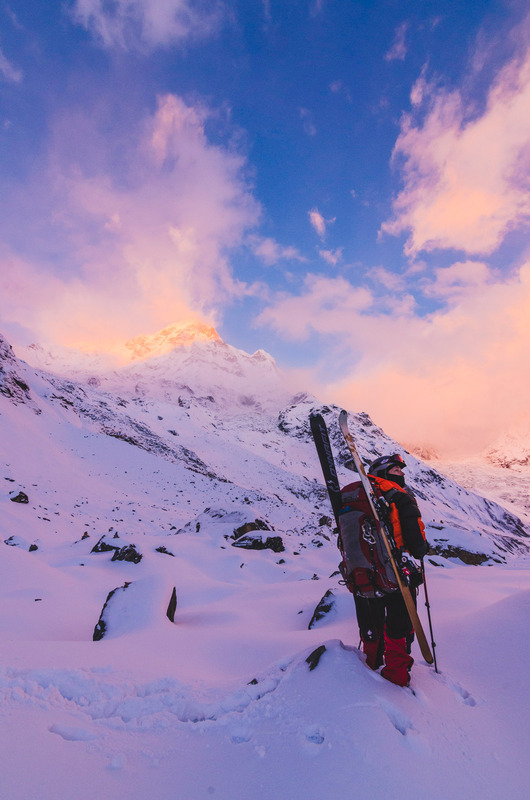 Partnered with a group of Austrian and German instructors, the NFSS hopes to one day develop both domestic and international sustainable ski mountaineering tourism in the Himalayas without building any infrastructure that will affect the sacred mountain’s landscape. Enjoying a teaching moment with an intrigued local. As a new organization in an evolving sport demographic who frequently asks for corporate sponsorship, the NFSS has had a difficult time procuring necessary equipment and funds to be up to western standards for ski gear. However, the team makes do with what they’ve been given. The NFSS has hosted two educational trips and performed several ski descents from mountaineering routes such as Mera Peak. 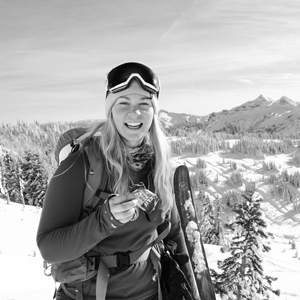 As two Pacific Northwest skiers who are spoiled with quality gear, attempting to backcountry ski with the setups provided by the NFSS was a new challenge. The skis had scars and gashes and the bindings were, to be polite we’ll say… historic. Plus, the group of Nepali administrators who were managing the foundation while the European instructors were away did not quite understand the necessity or process of using skins for touring. To our surprise, as we evaluated our gear during the packing phases of our trip, we realized the skins paired with the skis had not been cut for the skis themselves. As a result, my skins were nearly a foot too long for the skis provided. A mere speed bump, not a trip ruiner. In total, we each trekked for seven days in packs weighing roughly 55-pounds to reach base camp. Out of a personal stubbornness, I refused to hire porters and preferred to do the trip unassisted. Our starting location was Nayapul, which is roughly an hour and a half taxi drive outside of the wonderful lakeside town of Pokhara. Once in Nayapul, the first leg of the trek was fairly straightforward, following an old dirt road most of the way. The final hour was a stair climb to our first stop: the town of Ghandruk. With relentless stairs and at times ice covered trails, a few words of advice would be to bring microcramps or an old pair of socks to wear on the outside of your trekking boots for some added traction. Having so much weight for such long days, having a little extra support is necessary. On that note, trekking poles and even knee braces will save your joints a lot of misery when ascending and descending flights of boulder stairs for hours on end. I’m a fairly young, active hiker and even my knees felt destroyed on the last few days of our hike out. Once at Annapurna Base Camp we were able to post up in a teahouse lodge for three days and drop some weight. The weather patterns change quickly in the Annapurna Range. Every day, like clockwork, gnarly clouds would roll in at 2pm, covering base camp in white and dumping buckets of powder. After observing the continued daily whiteout, we decided not to attempt a mountain summit given the conditions. But we would be psychotic to trek in for seven days with weight not to ski something! Therefore, without skins to make life easier, we woke up every morning for an alpine start and post-holed our way up various lines and mountainside slopes. Each day was hours on hours of stomping through waist high powder and pulling ourselves up inclined slopes to eventually earn: One. Glorious. Turn. Enjoying a rare descent, as evidenced by the wide smile. The overall quality of the snow for skiing was mediocre at best, mostly wet with no solid base. Yet the scenery could not be beat. Setting fresh tracks through spreads of white powder while surrounded by mammoth mountains is unreal. 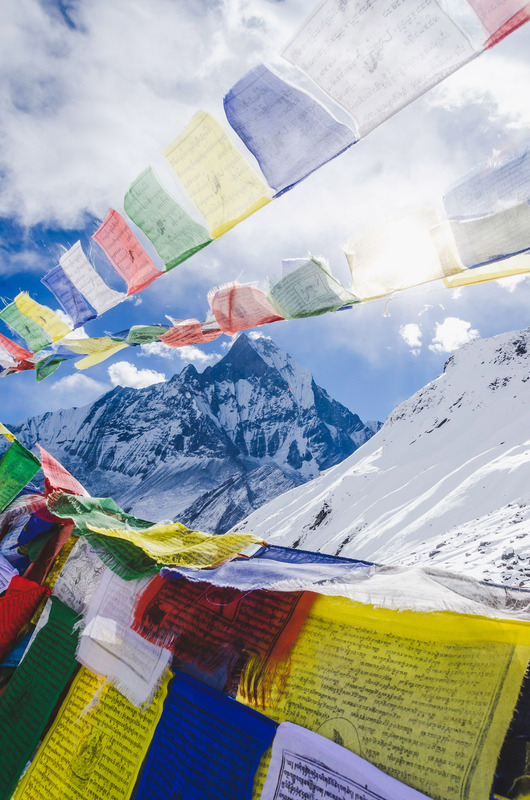 Annapurna Base Camp sits at nearly 14,000-feet and even at its base the peak summits look as if they stretch into the clouds. Truly, the Himalayas are the ‘Roof of the World’. Trekking out took four days but could have been done quicker. We decided to take our only rest day of the trip at the village of Chhomrong. What was the primary motivator to stay in Chhomrong for a full day? The food. 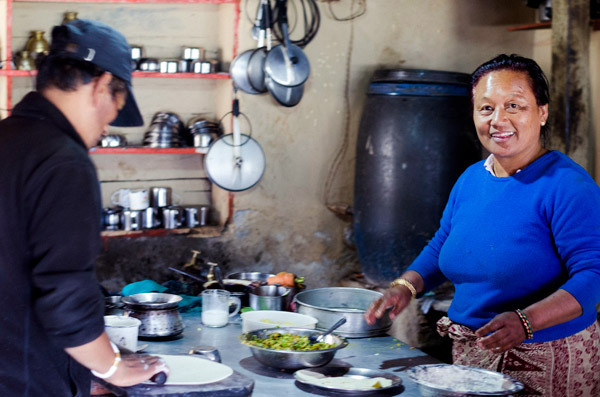 If you’re in the area, stop by the Chhomrong Cottage and let MaMa, or as her friends call her DiDi, whip you up the best MoMo’s you’ll ever taste followed by a trekkers burrito (yes, it’s a real burrito) and then top it off with a slice of her Time Magazine featured chocolate cake. I think the last day we waddled more than walked as we left MaMa’s cottage. Jason marveling at the Himalayan sunrise. As with every expedition, there were successes and lessons learned. We were able to spend three days backcountry skiing in ABC, and were told to be the first ones to do so (aside from heli-skiers). However, we could have gone during late February-mid March and possibly experienced a better snow base. When we return again, we plan to bring our own set of Voile skis and skins so that the gear quality can match our goals (let’s just say the historic skis did not hold their own very well in wet powder). 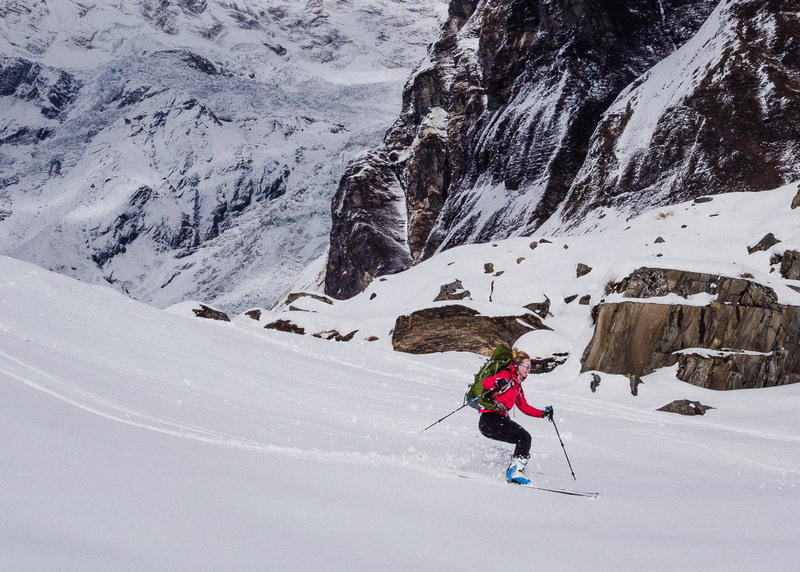 The important message to take away from this article is that skiing in Nepal is possible. But skier be warned: Nepal is the epitome of all things backcountry, so be prepared to truly earn your turns.